But it was true. I know the struggle of changing your diet. Reach out and ask for help! People love to share what is working for them. Glean, my friend, glean! Now I walk through a farmers market, or garden, or produce section and think: I can eat anything! I can eat all the colors and vibrant flavors and factory-free food. I love that. I do open some packages because Trader Joe’s has such a lovely selection! But mostly I clean, peel, chop, and store. 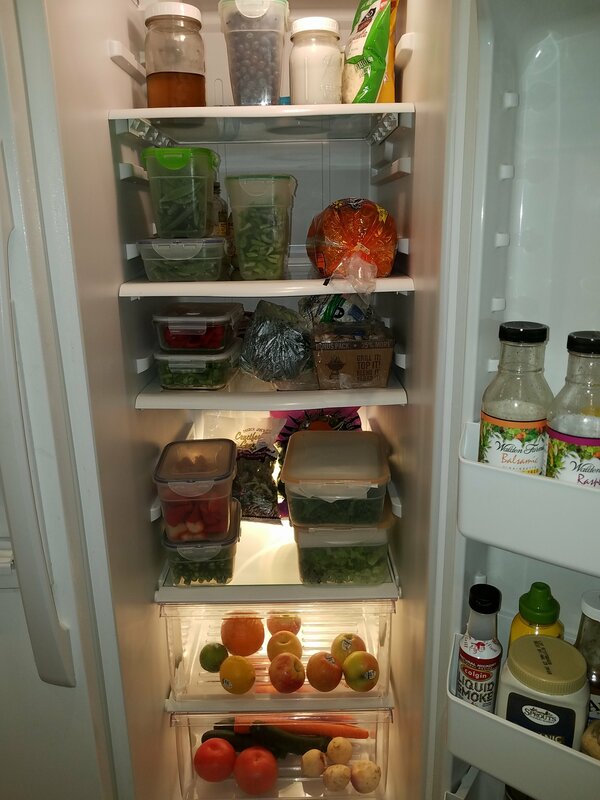 My favorite thing is when my refrigerator looks like a garden. Yesterday I made a cauliflower crust pizza with coconut milk cheese, lentil pasta with peas for lunch, and a bowl of green veggies and quinoa for breakfast. The day before I made pea puree for the first time and ate it with steamed carrots, broccoli and asparagus (I will be repeating that often), a large salad for lunch, and baked sweet potatoes with baked beans for supper. A breakfast of apple cinnamon baked oatmeal, lunch of a salad with 5-6 colors added in, and a dinner of stir fry yummy-ness is another recent day. Oatmeal loaded with beautiful berries, a veggie sandwich with raw veggies and hummus, and a bowl of pasta with spinach and tomatoes is one of my favorite days. Lentil shepherd’s pie is one of our new favorites as well as whole grain tortillas with refried beans topped with black beans and peppers. Mexican quinoa is one of my go-to’s (but my husband is not a fan) as well as a lovely bowl of veggie or lentil soup and perhaps a fruit salad. Not bad days of food, right? I drink lots of water, but I also have a large glass of iced coffee each or a glass of club soda with lime. Maybe a couple squares of extremely dark chocolate with a cup of herbal tea to end the day. My labs are improving, my skin is looking clearer and smoother, my hair is fuller, my joints don’t ache, and I am sleeping more soundly. What??? Yup. All true. All right — tell me your favorite plant-based day! Share in the comments, you just might help someone else when they struggle. Eating good in this plant-based neighborhood. Pea puree sounds good, I am looking at a sweet pea guacamole recipe; looks like I will have to try it! I love vegetable soup for breakfast. I find that simple is easy. A friend came in town this weekend. We went to a lovely farm to table restaurant and they had a vegetable dish that was on top of pea puree. I almost licked the plate! I asked and the chef gave me the recipe! Yay! Peas, spinach, cream, S&P. Easy peasy — I used coconut cream.